Leaning Tree - Is It Okay For A Tree To Lean? A leaning tree can worry homeowners, but generally, trees that lean naturally over time are not a cause for concern. However, trees that lean suddenly can be a sign of structural issues. Read on to learn why trees lean, when you should worry about a leaning tree, and what you can do to fix a leaning tree. Light: Trees need light to live. The truck of a tree curves because of the tree’s ability to adapt over time to the changing availability of sunlight. If a tree is planted too close to a structure or another plant that blocks the sun the tree will grow at an angle to avoid the shade and seek out the light. The tree’s root system will grow to accommodate this off-center weight distribution. Wind: Consistent low winds can cause trees to grow in the direction they are blowing. This is usually not a cause for concern. However, strong winds seen in heavy storms can cause a tree to become unstable and start to lean. In some cases, the tree will begin to uproot as it leans. This type of leaning is dangerous. Soil: When soil erodes from winds or water the roots of the tree become exposed. Because these roots are a tree’s anchoring system, soil erosion leading to exposed roots will cause instability causing the tree to lean and possibly fall. You should worry about a leaning tree when it exhibits the signs below. These signs are indicative of structural issues that may make the tree unsafe for the surrounding homeowners and property. If you see one of these signs get your tree checked out by a Certified Arborist ASAP. Keep An Eye On Your Tree: take a photo of your tree every year. If you think your tree is starting to lean or increasing its lean compare your tree’s current angle to past photos. This will make it easier to spot if the trunk’s lean has changed. 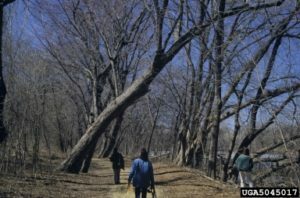 Trimming young trees in their first few years of life can help fix structural issues before they develop into big problems. Tree trimming later in life is a great way to remove deadwood and keep your tree healthy. If your tree does have a lean, tree trimming can reduce the weight of the crown or correct unbalanced growth to make it easier for your tree to keep its stability. Tree Cabling: Cabling a tree can help give your tree extra support to maintain its structural integrity during heavy winds or storms. If you’re concerned about your leaning tree, book an appointment with an arborist online or by calling 703.573.3029.